Mix light Italian dressing, lime juice, and sugar-free honey. Place chicken tenders in a ziploc freezer bag and pour marinade over chicken tenders to cover. Seal bag and give it a shake to cover the chicken completely. Marinade chicken for 2-3 hours. 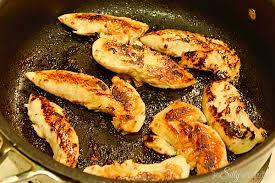 Cook chicken tenders in a non-stick pan or grill pan over medium heat until chicken is golden in color and cooked through.